The ultimate mobile English pronunciation aid, for students and teachers. 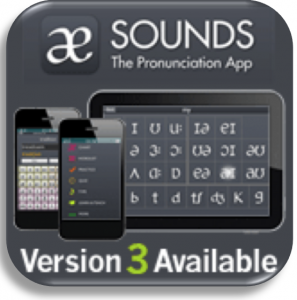 Based on the best-selling “Sound Foundations”, Sounds helps you study, practise and play with pronunciation wherever you are. In the App you’ll find three different practice modes – listening, writing and reading. You can either work using a random selection of words from the Wordlist, or select a particular sound (or combination of sounds) that you’d like to focus on and practise just those. The App includes a carefully selected Wordlist with over 650 high frequency words used in the Practice and Quiz sections. Every word in the Wordlist has an audio recording – available in both British and American English – and comes complete with definitions from the Macmillan Dictionary. Record, playback and compare your pronunciation with the model answer until your pronunciation is perfect! Mastered all the words included in the app? Buy new wordlists inside the app to cover commonly used words and vocabulary from Macmillan coursebooks including: Straightforward, The Business 2.0, Gateway and openMind/Mastermind courses. Priced at just £0.69/$0.99, each wordlist contains hundreds of new words and phrases. Explore the latest set of themed wordlists selected by Macmillan Dictionary to practice words on your favourite topics: sport, food & life skills! The chart shows all the sounds of English, divided into three sections: vowels, diphthongs (double vowels) and consonants. You can tap on a symbol to hear the sound, or tap and hold to hear the sound plus an example word. Listen to either British or American English. You can view the chart in either portrait or landscape mode, just by rotating your device. We’re absolutely thrilled to have received this prestigious award from the British Council for the Sounds app. The feedback from users of the app has been fantastic, and it’s great to see this recognized by the ELTons judges. We always knew that there was real potential with the recent developments in mobile devices for producing a tool that could really help students and teachers with the sometimes tricky topic of English pronunciation.